Get out the samba whistles and root for your favorite futbol team the FIFA World Cup is back! And guests visiting Walt Disney World during the 2014 FIFA World Cup can get into the spirit of the games in a variety of fun ways this summer. Every four years, soccer fans around the world tune in to cheer on 32 international men’s soccer teams competing for the Federation Internationale de Football Association’s (FIFA) ultimate title. The 2014 FIFA World Cup on ESPN kicked off June 12 and runs through July 13. With more than 20 locations at Walt Disney World Resort for guests to watch the World Cup, there is no shortage of spots to join in on the spirit of competition and camaraderie. 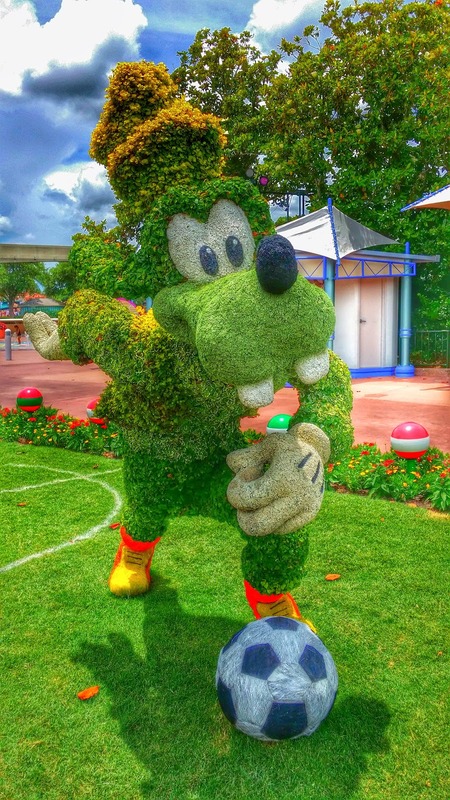 At Epcot, guests can celebrate the competition with some exclusive Disney experiences including a fun photo op with a themed Goofy topiary, and there’s even a special soccer experience in the Germany Pavilion for those who want to practice their skills. The Odyssey Center in Future World will be open throughout the competition to give fans a chance to catch the games on multiple big screens. The must-stop destination for fans of futbol is the new United World Soccer store at Downtown Disney where guests can purchase specialty merchandise to cheer on their favorite teams while the world watches the events unfold in Brazil. New soccer-themed items with a splash of Disney include pins, apparel items, mugs and more and are available at Epcot. ESPN Wide World of Sports Complex – ESPN Wide World of Sports Complex Grill and Welcome Center. Among the world’s most widely viewed sporting events, all of the World Cup’s 64 matches are being broadcast across ESPN, ESPN2, ESPN Radio and WatchESPN. Select games in Portuguese are broadcast on ESPN Deportes.